With the dramatically increased access to tools and resources that came with going off to college, I wanted to build a second electric vehicle, more refined, more powerful, and more fun than my previous one. This is the result of my efforts. This was my first big project at MITERS, the MIT Electronics Research Society, where, for the first time, I have access to real machine tools. Over the course of this project, I learned how design parts and assemblies in Solidworks, and got fairly proficient at using a manual mill and lathe. The basic design for this vehicle came from the classic Radio Flyer tricycle, but this was scratch built with a number of performance increasing enhancements. It features side-to-side leaning for better cornering, an incredibly oversized brushless motor, an eight speed manual transmission, and a custom differential, among other things. It has a (untested, because I'm not brave enough) top speed somewhere in excess of 40 mph, enough torque to throw off the unprepared rider, and is guaranteed to get you funny looks every time you ride it. In case the title was not clear enough, I made an electric tricycle. While it may be comically small, don't confuse this for your average pedal-powered Radio Flyer though. This vehicle was designed solely to be a fun thing to ride, and is more comprable to a go kart than anything else. Although it is an entirely impractical vehicle for doing anything useful, it has been suggested that I ride it to my classes. The idea for building this came from a combination of wanting to build a better electric vehicle than my previous one, and from getting the chance to ride someother very small but very fun electric vehicles. The parts were first designed in SolidWorks, and then machine manually, using a combination of hand tools, a mill, and a lathe. Since I designed most of the trike on a computer before building it, I did not have to change any of my designs half way through. I made it at MITERS, MIT's student run shop/hackerspace. In addition to having the tools I needed, MITERS also has lots of awesome people who know about making a huge variety of different things. Especially electric vehicles, multicopters, and Tesla coils, though. I learned how to CAD in SolidWorks, and how to use a manual mill and lathe. I also got more familiar with brushless DC motors, and how they are controlled. Most of the actual building of this project went smoothly, so the biggest challenge was diagnosing some very unusual motor and motor controller problems I had. It turned out that the motor I used had an intermittent internal short. Sometimes it would work just fine, which made it very difficult to diagnose exactly what the problem was. Step 1: Why Did I Build This? There are a lot of answers to that question. If you plan on building some sort of silly electric vehicle, or anything else for that matter, any or all of them may apply. Because Building Things! Building things for the sake of building things is a perfectly valid reason to start a project. I have built plenty of things that I have rarely used afterwards. The process of designing and building things is often at least as rewarding as actually using the things you build. Take my Nyan Hat project, for example. 2 weeks of building, and I've used it in total for an hour tops. Learning new skills. Before this project, I had hardly used any CAD software beyond Google Sketchup. Now I am fairly comfortable modeling parts and assemblies in SolidWorks, and Autodesk Inventor to a lesser extent. I also got a lot better at machining things. The frequency at which I made terrible noises on the mill and lathe decreased significantly over the course of this project. End product. Before building this, I had some experience riding some other small go-kart like electric vehicles, Chibikart and Tinykart. These vehicles were incredibly fun to ride, and I wanted to build something with similarly good handling and performance. At the world Maker Faire in New York, I took my scooter on the Power Racing Series track, and unsurprisingly found that it doesn't corner very well. Because I thought the idea was pretty funny. I really liked the idea of a vehicle in the form of a toddler's tricycle with an excessively large motor and dangerously fast top speed. Nyan Hat again is another great example of something built mostly because I thought it would be funny. Because I acquired a very large electric motor. I didn't design the tricycle because I got the motor, but I did build it when I did because I got the motor. I have started plenty of projects simply because I wanted to put to use some really cool part I found. The tricycle has a fairly complicated powertrain compared to most small electric vehicles. Before getting into the details of how to actually build anything, here is a brief overview of how the tricycle's various parts work together. Since by far the most common question I have gotten about the tricycle is "How long does the battery last? ", or some variation thereof, I will start with the battery. The battery pack is a 39.6 Volt 7.5 Amp hour pack assembled from 36 A123 Systems 26650 cells in a 12S3P arrangement (groups of 3 cells in parallel, 12 groups in series). That's about 300 Watt hours of energy. Given the characteristics of these cells, this battery pack can deliver 14256 Watts peak, and 8316 Watts continuously (That's 19.1 and 11.15 horsepower respectively). The motor controller turns a Turnigy C80100-130 brushless DC motor. 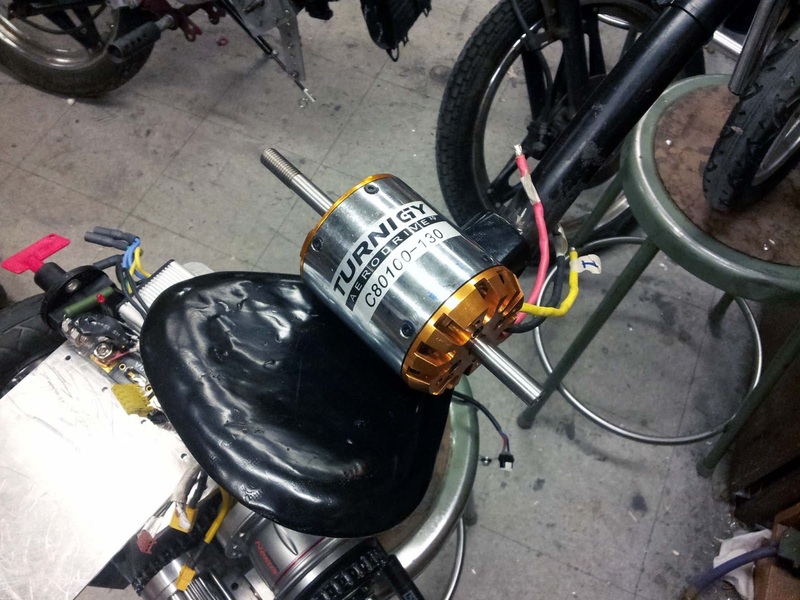 This is RC aircraft motor, rated for 6,000 Watts peak. Imagining the kind of RC airplane this is designed to be used in is kind of terrifying. Via another chain reduction, the output of the gearbox turns a custom spur gear differential, which splits the torque from the motor to the two back wheels. Each of the back wheels is equipped with a set of disk brakes, which are actuated with a double-pull brake lever on the handlebars. Steering is accomplished very similarly to a bicycle or motorcycle. In addition to the handlebars turning the front wheel, the front half of the trike's frame also tilts side to side. The tilting motion allows for fast, stable turns, which would not be possible if the frame were rigid. The first part of the frame I worked on was the fork. I started out with an old mountain bike fork, and removed the original suspension assembly. Removing the suspension left two short steel tubes as the fork legs, with ugly threaded holes left over where they joined the aluminum fork crown. To cover these holes, I turned some aluminum plugs that press fit into the holes. So that the fork could actually hold the front wheel, I had to weld on tabs to hold the wheel. I roughly cut out the tabs from some steel stock on a bandsaw, and used a mill to clean up the cuts. To hold the tabs at the correct spacing while I welded, I fixed them together with a threaded rod. I then MIG welded the tabs to the fork legs. The front half of the tricycle's frame was constructed from welded steel tubing. Originally, I planned on buying some steel tubing and bending it to the correct curvature for the frame, but I happened to find a tube of almost exactly the same curve radius as I designed into my CAD model in a corner at MITERS. The head tube was also made from some scrap steel tubing. The inside was bored out to the correct diameter to press in a bicycle headset. To join the two tubes, I first mitered the end of the curved steel tube using a hole saw. I then MIG welded the two tubes together. The front half of the tricycle's frame is able to tilt relative to the back half, so that the rider can lean into turns. To make the pivot, I attached a precision ground 3/4" thick steel rod to the back end of the curved steel tube. This rod is inserted into some bronze bushings in the back half of the frame, allowing it to rotate. To hold the steel rod, I made a steel plug and welded it into the end of the curved tube. The plug has a 3/4" hole drilled through it for the rod, and two set screws that can be tightened into the rod, holding it in place. The stem is the piece that holds the handlebars to the fork's steerer. These can be purchased from any bike shop, but I chose to machine my own from a billet of aluminum. I started out by facing all four sides, to get everything square and smooth. I clamped the block to a rotary table on the mill, and machined a circular lip into the the base. This lip holds the headset bearings in place. While on the rotary table, I also machined a nice curve into the stem's faceplate. The stem holds onto the steerer and handlebars by clamping onto them. To make the clamps, I first bored holes to the correct diameters for the handlebars and steerer. I made these holes by first drilling pilot holes with a drill bit, and then using a boring head to precisely finish the holes. I drilled and tapped holes for the clamping bolts, and then cut slots into the stem on a bandsaw. When the bolts are tightened, the slots allow the size of the holes to decrease, causing them to clamp down on the steerer and handlebars. To remove sharp edges, I sanded all the corners and edges with a belt sander. The sufraces were then brushed with sandpaper by hand, so that they looked nice. The since the gearbox I used was deigned to be laced into a bicycle wheel, I had to make some modifications to it to prepare it for electric vehicle use. First, I used #35 chain in the trike's drivetrain, rather than bicycle chain, so I had to modify my #35 chain sprocket to interface with the hub. The hub's input gear uses three rounded splines to transmit torque to the gearbox. To approximate these splines, I first bored out the center of my gear to the same minor diameter as the bicycle gear that came with the hub. Then, using an indexing head, I milled the hole wider everywhere except where the three splines were. This created an approximately trapezoidal shape that fit into the three grooves on the hub. The next part to be modified was the hub's output. Since the hub normally goes at the center of a bike wheel, the hub's output is the entire outer casing of the gearbox. I wanted the hub to spin a small sprocket, so I had to make an adapter plate to which I could bolt the sprocket. Since I didn't have any aluminum round large enough, I turned the adapter from a combination of 1/2" aluminum plate and 2.5" round, and bolted the two parts together. The adapter attaches to the gearbox by bolting through the spoke holes with 4-40 screws. The new output sprocket was attached to the adapter by drilling six holes in it with an indexing head. Because for both the input and output sprockets I chose teeth numbers that were multiples of three, I was easily able to center them in the lathe and indexing head. Adding a differential to the drivetrain was more of an exercise in building something awesome and machining it to spec than a useful addition to the drivetrain. So, before I go through how I built it, I'm going to go through a number of cheaper and easier alternatives. 1-wheel drive. This is by far the simplest option. You may get a bit of torque steering when you open the throttle, and you cut the maximum acceleration (assuming it is traction limited) in half. Buy a differential. A company called SAMAGAGA makes differentials for pedal powered tricycles. They don't have a retailer in the US, but if you contact them they'll sell you a differential for around $70 plus shipping. Build a different kind of differential. I recently discovered a source of cheap helical bevel gears, and designed a conventional differential using them. It is made of fewer parts, is easier to machine, and is cheaper to build. Assuming you have ignored the previous suggestions, here is how to build a small spur gear differential. First, I recommend you read Charles's spur gear differential build, which I based mine off of. All the above parts were sourced from McMaster, except for the bearings, which were from VXB Bearings, the aluminum stock, which I scavenged, and the 1/2" drive shaft, which came from Surplus Center. The first step was to cut the spur gear rod to length. Rough cuts were made using a horizontal bandsaw, and the ends of the gears were faced to size on a mill. Next, the gears were bored out, and pressed with bronze bushings. Fortunately, the gears have 12 teeth, meaning they are easy to center in a 3 jaw chuck on a lathe. The differential's endcaps were turned on a lathe. The six counterbored holes were made on a milling machine. In order to center the part on the mill, I held the endcaps in an indexing head. Although I drilled the holes in X-Y coordinates, using the indexing head made it very easy to zero the axes of the mill. Before drilling these holes, make sure that the mill is straight! I didn't do this, and as a result, all the holes were drilled at a very slight angle. As a result, I had to fiddle with assembling the differential for hours to get it to work smoothly. The differential is spanned by six precision steel rods. These rods both hold everything together, and serve as the axles for the four spur gears. To make sure these rods were all exactly the same length, I faced their ends simultaneously on the mill. To do this, I drilled six holes through some square aluminum stock, and cut a slot into each hole. When the rods are inserted into the holes in the stock, and the stock is clamped by its ends, the slots compress and hold all six rods simultaneously. The ends of the rods were bored out and tapped to 10-32. The 20 tooth output gears I got from McMaster came without a keyway in them. Since I did not have a 1/8" broach to make a keyway, I ground my own single-point broach out of a tool steel blank from the lathe. Using the mill, I repeatedly pressed the broach down through the gear's bore, slowly progressing the mill bed each pass. The differential is fairly straight forward to assemble - the rods are inserted into their respective counterbored holes in one end cap, the gears and spacers are placed on their shafts, the axles and output gears are inserted, and the second endcap is placed on. To keep the differential true, I had to sequentially tighten the bolts around the perimeter - this means incrementally tightening opposite pairs of screws, so that the endcap isn't pulled to an angle. The drive gear is held in place by the same bolts that hold the differential together. The front half of the frame pivots around a steel rod inserted through two bushing blocks in the back half of the frame. These blocks were milled from solid aluminum stock. The centers were bored out and pressed with 3/4" I.D. bronze bushings. The bases of the blocks were drilled and tapped for 1/4-20 screws. The base upon which the entire back half of the trike was built is a 5/16" thick aluminum plate. The bushing blocks were attached to it with countersunk flat head 1/4-20 screws. To stop the steel rod from sliding out of the bushings, I inserted a clamping shaft collar onto the shaft, between the two bushings. To stop the front half of the tricycle from falling over when it was not moving, I added a pair of air springs to provide a little bit of resistance. The springs were held to the base plate by bolts tapped into the edges of the plate, and to the steel frame by a tapped steel tab welded on. The back half of the frame, which houses all the the interesting bits, was made from seven aluminum plates, fastened to each other by bolts threaded into their edges. If you have access to an abrasive water jet cutter or high power laser cutter, this is the time to use it. I did not, so I made these parts manually. I started out with a length of 1/4" thick by 6" wide aluminum plate. I cut some segments of it roughly to length on a bandsaw, and then faced the edges on a mill. Also on the mill, I drilled holes and slots in the appropriate spots to hold the motor, driveshaft bearings, and gearbox. Once the plates were appropriately drilled, I cut them into paralelogram shapes on the bandsaw/mill. The four vertical plates are held in place by bolts threaded into their top and bottom edges. So that these four plates would be perfectly aligned I drilled all these edge-holes simultaneously on the mill. So the screws wouldn't protrude, I used flat head socket cap screws, all stainless steel. As a result, the holes in top and bottom plates were all contersunk. The frame's top plate was made in two pieces. The battery pack is stored in the leftmost section of the frame, so I wanted the cover to the battery compartment to be easily removable Since I could not edge tap both plates, I made a bar with holes tapped through it on two faces, that the second top plate bolts into. The last major frame piece is the bearing blocks, which take most of the load from the two rear wheels. Each bearing block consists of a simple block of aluminum stock, with a pair of bearings pressed into it. The bearing blocks are held in place both by large 1/4-20 screws from underneath, and from the side by 8-32 screws. For the back wheels, I started out with these scooter wheels from Monster Scooter Parts. The front wheel is one of these. The back wheels required significant modification to work. They are meant to ride on bearings on a fixed axle, rather than a live axle like my trike uses, so the first thing I did was remove the original bearings. I had no need for the stock band brakes or drive sprockets either, so I removed those as well. To interface the wheels with my 1/2" driveshafts, I needed to make some hubs to attach to the wheels. I planned on making my own, but I found some hubs that were almost exactly what I needed left over from SEGFAULT. In order to attach the hubs, I first had to machine off the part off the original hub that held the drive sprocket. To attach the disk brakes to the hubs, I made some adapter plates out of some scrap 1/4" aluminum plate. To make a seat, I started out with the plastic sub-frame of an old bicycle seat. The plastic frame bolts to two metal rails, that in a bicycle would be clamped b the seatpost. I welded the rais to the tricycle frame,supported by some more steel tubing and box extrusion. To make the surface of the seat, I molded over the plastic frame with fiberglass cloth wetted out in epoxy. All I had was 24 hour epoxy, so to cure it faster, I put the seat in a toaster oven at low temperature (200 f). This decreased the epoxy's curing time to about an hour from 24. Unfortunately, I started out with a different variety of epoxy, which reacted poorly to the high temperature curing. It foamed up and turned orange, I painted over the seat in black to cover up the nasty epoxy color. Irregularities were fixed by sanding and filling voids with thickened epoxy. The seat is not very comfortable for just sitting in, but once you put your feet on the foot pegs and get moving, you get pushed towards the back half of the seat. The tricycle has a pair of disk brakes, one for each back wheel, to stop it. I used these brake disks, and these calipers (right and left) from Monster Scooter Parts, since they were much cheaper than using mountain bike disk brakes. Because they are relatively low quality brakes, they take a lot of adjustment to get working well, but once they are properly adjusted, they can bring you to a stop very quickly, and are easily powerful enough to lock up the back wheels at speed. The brake calipers were mounted through the corners of the bearing blocks as well as one of the vertical aluminum plates. To space them correctly, I machined an aluminum spacer for the bolt passing through the plate. Fortunately, the brakes are very adjustable and also floating on their mounts, so you do not have to position them extremely precisely. The brakes are actuated by a double pull brake lever on the handlebars. I used this model. Since both brakes are actuated by one lever, even more adjustment is needed for the two wheels to brake evenly. There are a few other mecahnical parts of the tricycle that are too small to warrant their own steps. The motor, gearbox, and differential are connected to each other by #35 chain. As far as I've found, the cheapest place to get this chain is Surplus Center. The motor and the gearbox happened to be spaced perfectly, so that I did not need any sort of chain tensioner to make the chain fit between them. I was not so lucky for the chain between the gearbox and differential however. I quickly made a chain tensioner by machining my own idler sprocket out of some nylon stock. Since I placed the chain tensioner on the low-tension side of the chain (where the chain returns from the differential to the gearbox) the sprocket did not need to be made out of a very robust material. I pressed the sprocket onto a bearing, and fixed the bearing to the aluminum plate next to the chain. In order to tension the chain, I used a bolt that was smaller than the hole through the bearing. This let me tighten the bearing down eccentrically, in order to adjust chain tension. Since in the bearing blocks, I used flangless bearings pressed into place, the bearings would be unlikely to support large thrust loads that might occur when turning. To support these loads, I used bronze thrust washers, which are sandwiched between a shaft collar on each side of the bearing block. 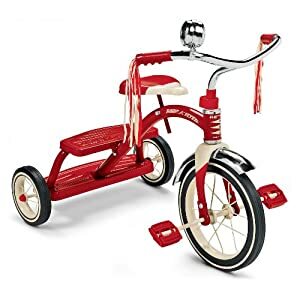 Since this tricycle, unlike those small children ride, does not have pedals, the front wheel needed somewhere for your feet to rest. I turned some foot pegs out of aluminum tubing, and tapped their ends so that they could thread onto the 1/2" threaded rod I used for a front axle. The final mechanical step was modifying the motor. The original motor I had was already ready to use, but it ended up having some internal shorts. This lead to many hours of troubleshooting with local motor expert Shane, and finally replacement with a new identical motor. To prepare the motor, first I cut off the shaft protruding from the back end. This shaft if for attaching propellers to, so it was unnecessary I then milled a flat and a dimple 90 degrees apart from each other in the drive side of the shaft. When set screws on the drive sprocket are tightened into the flat and dimple, they stop the sprocket from rotating independently to the shaft. The dimple also stops the sprocket from shifting axially. Building the battery pack was hands down the most dangerous step of this project. For each battery pack (I built two), I used 36 A123 Systems 26650 cell, in a 12S3P configuration. Since I used raw cells, I had to solder the cells together myself. This is where things get nasty. One of these cells is capable of briefly discharging 120 Amps. When you are soldering the battery pack, you are poking metal things around the exposed contacts of large groups of these cells. Accidentally causing short circuits can do some serious damage. A short through something thin will probably vaporize the wire that caused the short. Whatever happens, there will be a lot of heat involved. Fortunately, at least, these cells are much more stable than hobby grade lithium polymer cells, so they will not explode in flames if damaged, overcharged, or overdischarged. I highly recommend that you don't build a pack like this, unless someone who knows what they are doing shows you how to first. To build the pack, I started by organizing the cells into groups of three, tacking them together with hot glue, and soldering the cells in parallel with heavy duty copper braid. I then glued these modules together, and soldered them in series with more braid. The 12S battery pack was organized into two layers, each of which was a 6S pack. This let me use 6S balance connectors, since my battery charger cannot balance charge a 12S pack. To protect the pack, I used 3 liter soda bottles as heat shrink. When the bottles cool down, they form a hard shell around the cells. Between the two layers, and on the inside of the battery compartment, I added a few layers of vibration dampening foam. To cover up the battery compartment, I made a shell by bending some matte black acrylic and gluing it to the metal top plate above the battery compartment. To bend the acrylic cleanly, I clamped large aluminum blocks just above and below the bend line, and heated the line with a heat gun. The aluminum blocks support the acrylic while you bend it, and also keep the material you don't want to bend cool. Since I used an off the shelf motor controller, the vehicle's electrical system is pretty straight forward. The battery pack is connected to the Kelly controller through a pair of XT60 connectors, and the controller connects to the motor using 5mm bullet connectors. Between the battery pack and the controller is a 100 Amp fuse, and a large power switch. In parallel with the power switch, I added the large 10K precharge resistor included with the controller. This resistor prevents a huge current surge from flowing into the controller when it is connected to a battery. All the electronics were bolted to the underside of the frame's aluminum top plate. The challenging part of the electric systems is setting up the motor's hall effect sensors. To learn much more about sensored vs sensorless control of brushless dc motors, I recommend you read this guide to EV power systems. Since my motor does not have internal hall effect sensors, I had to attach these sensors externally. I did so using this sensor holder and sensor PCB from e0designs, in the 80mm variety. For how to set up the sensors, I will again refer you to e0designs, which has an excellent guide for how to do this. The Kelly controller has a number of options that can be programmed in via computer. I disabled all regenerative braking, since the gearbox has a freewheel built in. Also, I limited the motor's top speed to 85% of maximum, and peak current to 90% of maximum, because apparently this can help prevent the controller's built in over current protection from being tripped and shutting off the vehicle. The steering system definitely takes some getting used to. It's hard to just sit down an ride, like on a go kart, since the trike isn't statically stable. You usually have to give yourself a little push to get enough balance. Having your feet on the front wheel, and therefore part of the steering, also takes some getting used to. I think though, this helps to make the trike more stable at high speeds, since your legs help to hold the wheel straight. Because of the lean-steering, it corners very well. Even though most of your weight is right over the back wheels, you can still lock up the wheels and slide around corners with practice. I had to shorten the foot pegs, however, as they scraped a few times while making very fast tight turns. Because of the gearbox, it's geared for a top speed of around 18 mph in the lowest gear, meaning that the torque from a stop is ridiculous A few people have had the trike just shoot out from under them, because they were not ready for it. The close gear ratios mean rapid-fire shifting up until around 5th gear. Past 4th gear, I have found that I consistently trip the controller's over current protection momentarily when accelerating. I have been told that choosing the "high speed" motor option for the controller would probably fix this problem, but its too late for that. I still have not ever maxed out the trike, but as it is geared for a no-load top speed of 55 mph, realistically the top speed is probably somewhere in the 40's. In terms of battery life, I have not timed riding time or measured distance traveled, but it seems to last for around 1/2 hour of riding. It really depends on how hard you push it though. Since I have a second battery pack that can be switched in in about two minutes, you can fit in plenty of riding. My charger can recharge each pack about an hour. I have entered this Instructable in two contests, the UP! contest and the Make-To-Learn Youth Conest, so please vote if you like this. Can this be done with a small gas engine? yes. it can be done with gas engine of 50cc. Im sure it could be done. I think it wouldn't be ideal for riding to class because it would be loud, but most people who make this would probably build it for street pleasure so yes! This is the reason I want to go to MIT so badly, and I'm trying to learn as much as possible, but looking further back, the stuff you did when you were my age, is incredible and makes me doubtful of my real chances. Heed Ben's warning about the danger of this step! Batteries contain a surprising amount of energy, and shorting them can be very exciting (but not in a good way!) I would stongly recommend that you use tabbed cells as well. One thing that will severely shorten the life of any cell is heat. Tabbed cells have a solder tab spot welded onto the ends, allowing you to solder them together without getting the ends of the cells hot. Soldering directly to the button on the end of a cell risks overheating - melting the internal support structure - and causing the cell to leak or, if you're really unlucky, short internally - which turns the cell into a heat bomb! Sweet ibble! I have been toying with the idea of putting something like this together. I have a couple 12 volt motors from cordless lawnmowers gathering dust and this seems like the perfect application. If it comes together I will do an ibble up myself and certainly reference your inspiration. Cheers. Nice engineering - You could do without the diff and just drive one wheel with little loss of traction and a saving in weight and complexity. Certainly (although the weight savings would be pretty minimal - the differential weights only a couple pounds). The fist thing I say in the "building the differential" step is that there are a bunch of easier alternatives, single wheel drive included.